“Codice Privacy: tutte le novità del d.lgs. 101/2018” – it is the first commentary on the Italian Privacy Reform of 2018 and was written by lawyers Luca Bolognini and Enrico Pelino, in what was defined by the latter “a race against time in tandem”. This work represents a first look into all the changes introduced by the Legislative Decree No. 101/2018 which adapts the national norm (the so-called Privacy Code) to the recently modified framework of European law on the Protection of personal data. This Decree implements the GDPR (Regulation (EU) 2016/679, which came into force on the 25th of May 2018) concerning the protection of natural persons with regard to the processing and free movement of personal data and was published in the Official Gazette on the 4th of September 2018, which then came into force on the 19 th of September 2018. The Decree’s provisions foresee which specific parts of the 2003 Privacy Code may be maintained because they fit the new GDPR structure. The coming into force of the Legislative Decree No. 101/2018, has created a regulatory framework that is not so easy to interpret. This commentary may be an excellent tool so as to sort all the interpretation and coordination issues, in an orderly fashion. The validity of the child’s consent in information society services. For a detailed index of all the topics covered: https://shop.giuffre.it/media/Catalogo/Indice/INDICE_024203119.pdf. What is very useful as well is the comparative table between the new and the former writing of D. LGs. 196/2003 which allows to summarize and classify the set of changes introduced in the appendix to the book. 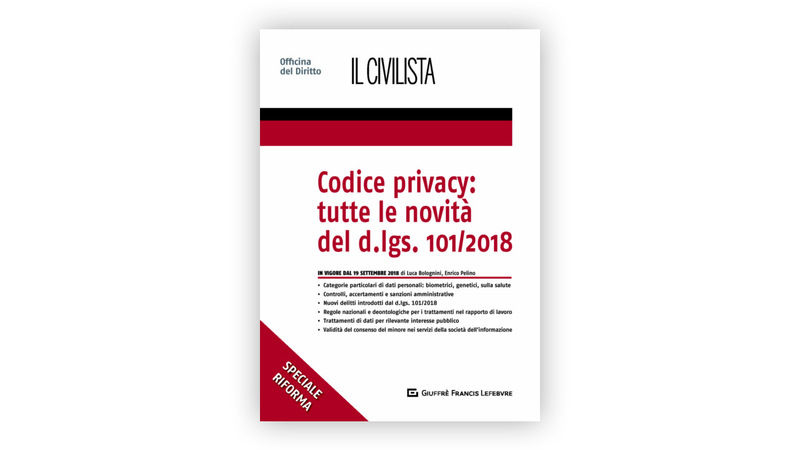 “Codice Privacy: tutte le novità del d.lgs. 101/2018” is not the first commentary born from the collaboration and work between two privacy experts such as Bolognini and Pelino. Let’s not forget “The European General Data Protection Regulation. Commentary on the new personal data protection 2016 Regulation “. This volume is a full commentary on the Regulation (EU) 2016/679; and it is intended not only for lawyers, magistrates but also for corporate lawyers, managers, researchers or institutional subjects involved in the legislation. This work explores all the novelties of the Regulation, such as the principles of accountability and data protection-by-design, the right to data portability, the Data Protection Officer’s role (DPO), privacy impact assessments and more. (For info: https://www.amazon.it/regolamento-Commentario-disciplina-protezione-personali/dp/8814166595/ref=asc_df_8814166595/). In short, “Codice Privacy: tutte le novità del d.lgs. 101/2018” was the necessary and current follow-up to all legal and regulatory changes regarding data protection. The book is available for purchase in all the bookstores and online at the following address: https://shop.giuffre.it/catalog/product/view/id/78087/s/codice-privacy-tutte-le-novita-del-d-lgs-101-2018/.